Researchers at Cima, Clínica Universidad de Navarra and the Faculty of Sciences, have predicted the appearance of this cardiac ailment via blood sample analysis. 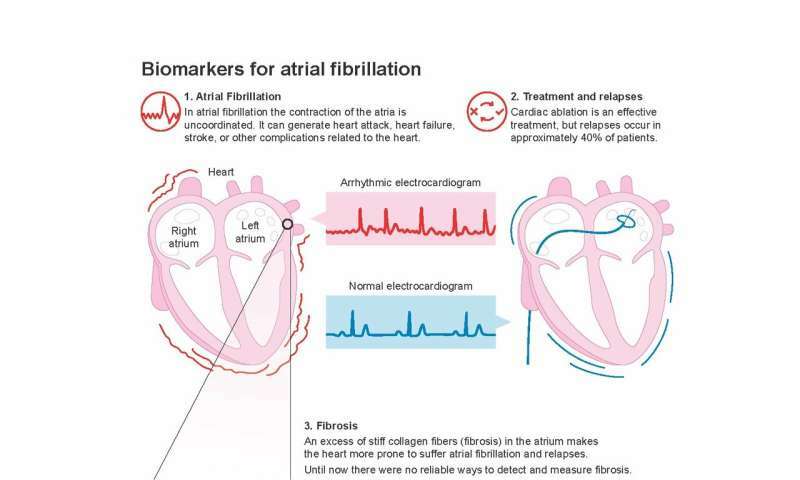 "The alteration of three molecules related to collagen metabolism (CITP, MMP-1, and PICP) determine the risk of suffering atrial fibrillation and the response to its treatment," explains Dr. Javier Díez, director of the Cardiovascular Disease Program at Cima, Head of Research of the Department of Cardiology and co-director of the Department of Nephrology at the Clínica Universidad de Navarra. The study was involved 392 patients, 150 of them treated with cardiac ablation. "We have found that patients with low blood levels of the CITP/MMP-1 ratio and elevated levels of PICP have a high risk of developing atrial fibrillation and that it recurred after cardiac ablation. The confirmation of these findings can lay the foundations to precisely adjust the most optimal treatment and follow-up for each patient according to these two biomarkers," adds Dr. Díez, also from CIBERCV.